We are a well-known entity, engaged in offering superior quality Addressable Heat Detector Zicom. This heat detector is provided in numerous specifications to choose from. 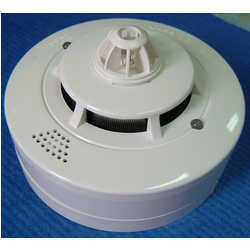 Offered heat detector is designed with help of top class material and sophisticated technology. Our patrons can avail this heat detector from us at nominal prices. Reset/Star-Up Times 10/30 seconds max. Order Code TYPE LED O/P CE MARKING APPROVAL CPD No. Established in the year 2014, we, NRS Solutions A Co., are engaged in exporting, wholesaling, trading, retailing, importing and supplying a wide range of the premium quality of Industrial Sirens and Allied Products. The product range offered by us is inclusive of Industrial Sirens, Flashing Beacons and Fire Alarm Panels. Owing to their easy installation, optimum functionality, low maintenance and longer serving life, these Industrial Sirens and Allied Products. Used in various system integrators, office buildings, residents and commercial malls for security purposes, the offered Industrial Sirens and Allied Products are procured from trusted and reliable vendors of the industry. We have been able to cater to the precise needs of our valuable customers by making a long lasting association with some of the trusted vendors of the industry. Known for making quality assured materials and latest machinery, our vendors are associated with us over a long period of time. In addition to this, our vendors hold expertise in their area of operation.